The comment period for the NPR-A Draft Integrated Activity Plan/Environmental Impact Statement closed on June 15, 2012. Thanks to all of those who commented on the plan. According to National Audubon: The nearly 23-million-acre National Petroleum Reserve-Alaska, the NPR-A, supports a stunning diversity and abundance of wildlife. Right now, the U.S. Department of the Interior is writing its first-ever, comprehensive plan for the entire reserve, providing the opportunity to protect the most important places for wildlife. Submit your comments by June 15, 2012 to be considered in the planning process. Why Is Teshekpuk Lake Important? 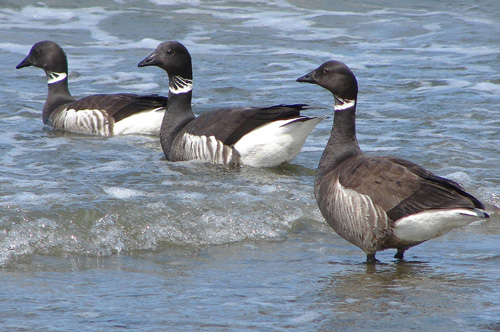 BirdNote science advisor and writer, Gordon Orians, writes: Imagine a place on the American landscape so rich and hospitable that it attracts and nurtures polar bears, caribou and more than 60,000 black geese, called Brant. You’ll find such a place on the northern Arctic plain of Alaska. Its name is Teshekpuk Lake. The wetlands surrounding the lake provide a food-rich haven for arctic-breeding geese during the late weeks in summer when they cannot fly. The birds are molting, and to survive this dangerous time, they must find a place rich in food and safe from predators. It’s the most important place for goose molting in Arctic Alaska, this Teshekpuk Lake. The 60,000 Black Brant represent about 20 percent of the world’s population, and they go to the rich sedge meadows surrounding the lake, as do many other birds. Teshekpuk Lake is also an important denning and feeding area for polar bears. 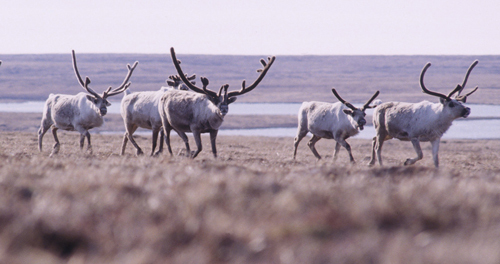 In spring, the 67,000-strong Central Arctic caribou herd gathers here to give birth to their calves. Because the Arctic plain is so biologically important for many birds and mammals, many who care about wildlife are urging that it be off limits to drilling for oil and gas. How can you help protect Teshekpuk Lake? These four areas are: the Teshekpuk Lake Special Area, the Utukok River Uplands Special Area, the Colville River Special Area, and the Kasegaluk Lagoon Special Area. The Plan’s Alternative A – which assumes the least intrusion – is the preferred alternative. Because millions of Americans are prepared to cut back on their use of gas and oil, conservation and increased efficiency of use – rather than continued drilling – should be the main alternatives. With your help, we can provide a larger voice to speak up for this land and for the wildlife that depends upon it. I ask that you adopt Alternative B in the final area-wide plan for the National Petroleum Reserve-Alaska (Reserve). This is the only alternative in the draft plan that properly balances future oil and gas development with reliable, effective protections for the exceptional wildlife habitat of the Reserve. Spanning a large part of the North Slope, the Reserve includes vital habitat for fish and wildlife resources of local, national, and global significance. Congress has specifically recognized that special areas and wildlife values exist within the Reserve and should be protected from oil and gas development. Alternative B provides essential and appropriate measures to ensure balanced management of the Reserve by protecting these areas: Teshekpuk Lake/Dease Inlet (Teshekpuk Lake caribou herd calving grounds and globally-significant Important Bird Area for shorebirds, waterfowl, and seabirds); Peard Bay and surrounding wetlands (a concentration area for marine mammals and nesting waterbirds); Utukok River Uplands/DeLong Mountains (Western Arctic caribou herd calving grounds and habitat for grizzly bears, wolves, and wolverines); the Colville River (exceptional densities of cliff-nesting raptors); and Kasegaluk Lagoon (a unique coastal area vital to polar bears, walruses, and beluga whales; also a globally-significant Important Bird Area). I strongly urge you to adopt Alternative B to protect these special areas with incomparable wildlife values.